Almost two weeks ago, I announced that I was hopping on the bandwagon once again for Lorelei's newest Michael's Reader Challenge. And yesterday I even gave y'all a sneak peek of my necklace. I played around with the idea of adding some color, but just couldn't make it look right. I'm sure some of the other participants did an excellent job overcoming that challenge. 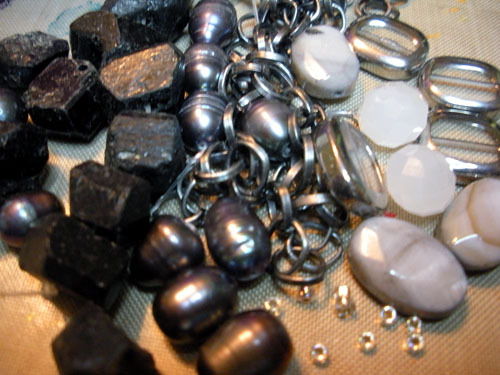 As I studied the beads, the black quartz nuggets began to look more and more like coal to me. Coal, at this time of the year, makes me think of what you are supposed to get in your stocking from Santa Claus if you are naughty. And there, the idea of Naughty or Nice was born. As you can see, I used the darker pearls, nuggets, and stacks of the chain on one side to represent naughty and the mother of pearl, clear/silver, white faceted, and seed beads on the other for nice. The naughty beads (hehe) are all wire wrapped with galvanized steel wire and the nice beads and strung on beading wire. For the focal, I used an oval aluminum piece I found in the scrapbook supplies. It has holes punched around its perimeter. I stamped the words "Naughty or Nice" into it and used a sharpie to blacken the letters. 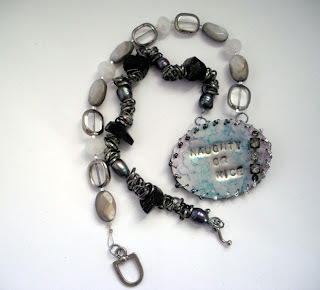 Blue and purple alcohol ink add a touch of color similar to the pearls. I then sealed it with a matte spray sealer before wrapping wire through the holes with seed beads. As well, a small strand of rhinestones was added for some sparkle. I used E6000 to glue black felt to the back for added comfort and to cover the wire ends. The clasp is a simple toggle clasp. I'm pretty happy with the results! Click on the links below to check out the other challenge participants and hop on over to Lorelei's blog for MORE! I'd LOVE to hear what you thought of my use of the challenge materials! WOW! This is so great! I love it! Great pendant, and super appropriate for the season! Nice Job! Very cool necklace, perfect for the season! I do love how you created that pendant too, way cool! *LOVE* that focal and love the Naughty or Nice theme - Fantastic job! Happy Blog Hopping! Super fun focal! 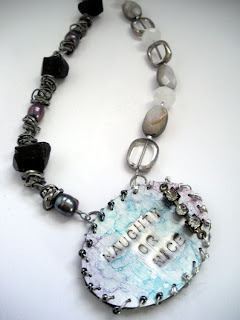 I love that you took something purposed for the scrapbook and turned it into something mixed media for your jewelry! Now THAT's what I'm talking about! Thanks for sharing your inspiration. Very very nice! I like!!!! Fun pendant and beautiful colour scheme all over. I like your own-made focal - lots of neat details there. But I really like your treatment of the chain! It looks totally cool. What a wonderful pc youve created really love this!!! Thank y'all so much for the sweet comments about my necklace. I had a lot of fun creating the focal and am glad to hear it's being well received! 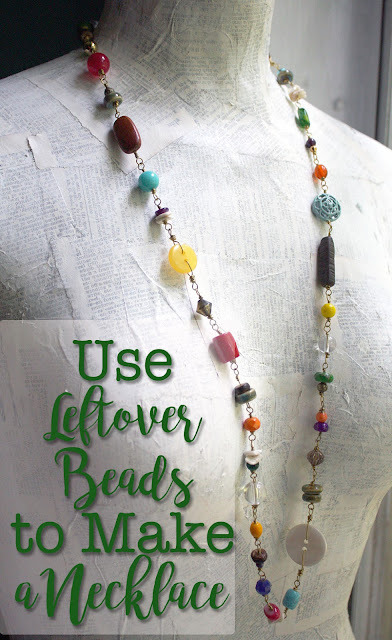 It's amazing the different styles of necklaces that have been created from this simple selection of beads. 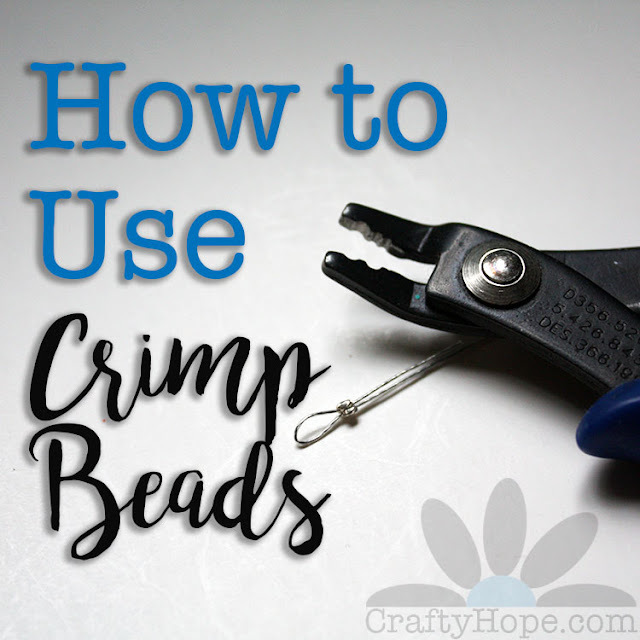 Loving the Blog Hop!! That's awesome! I love how we both looked at those black quartz nuggets and used them as our jumping off point. They make perfect coal for your naughty or nice necklace! I love how one side is naughty and the other nice. Kind of like an angel on one shoulder and a devil on the other. What a great idea! I liked the stacked chain-I had to look at it a few times to figure it out-very cool! I love it when something is used in a way it wasn't intended! Your theme naughty and nice was very clever too! Great job and Merry Christmas! (Your tweets look fun, so I am following you now! I'm lovin it! Awesome design! LOVE your focal! You really did a creative job with this challenge and I loved reading about your process. Super cool! Lovely use of the materials and great theme! I was also admiring your stash of keys. You really made the black quartz work. I love the way you added blue and purple ink and rhinestones to the focal, very creative! What silly Santa wouldn't want to leave a calling card like this for his favorite lady friend. I had thought about playing off the coal theme, too, but I'm glad I didn't -- yours takes the cake! I don't usually embarrass easily, but all of your sweet words do have me blushing slightly. I'm so very honored to be included in a group of talented jewelry artists like yourselves. I don't think I can say thank you enough. Thank you!